We all have a cupboard that we can’t reach. Often, we have to change the bulb/tube light even if we don’t want to. Some people have height to their advantage while the majority of them don’t. It’s not practical keeping one of those huge steel ladders at home, so luckily there is an alternative. This comes in the form of Aluminium ladder. But as might the case may be, a lot of people are apprehensive of the use of such ladders for safety reasons. It’s a valid fear. However, don’t let fear take a grip on your lives and try to be as practical as possible. 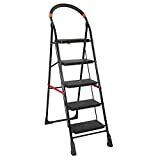 If you often face such difficulties as stated above, or, even some different issue that requires the use of a ladder, don’t hesitate to purchase one. These ladders don’t take up too much space nor are they bulky and a burden. Contrary to many people’s beliefs they are actually quite handy. It’s completely understandable if you need some help to decide which ladder to purchase. It’s not an item that’s on every person’s shopping list. So here are a few deliverables on the basis of which you can take a more informed decision on aluminium ladder, if you ever need to. Size: There are different sizes available for different needs. Don’t portray negative feelings towards an item because of a mistake on your part. Often people are disappointed with their purchase because of the ladder is either too big, or it’s too small. These days there are many ladders that have the option of adjustable height. So choose a ladder on the basis of your needs. Sturdy/Safety: Everyone has the fear of falling off a ladder. It may have happened to you at least once during your lifetime or if it hasn’t yet, brace yourself. But it is important to trust the ladder. And how do you trust a ladder? Before buying it look at if it is sturdy enough to hold enough weight, see whether it wobbles when you climb on it or not and there are also many ladders available these days that have additional safety features instilled in them, such as grip, etc. Safety is always a priority no matter what. Compact: A lot of people avoid this particular purchase because they consider it to consume too much of space. If that’s your primary concern look for foldable ladders and other such compact ladders. Rust-proof, high-grade aluminium with edge guards for use in all kinds of weather. With Bathla Sure-Hinge technology for maximum stability. Smart-Platform with serrated grooves for increased grip during use. 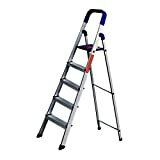 Heavy Duty Aluminium Ladder For Extra Durability With A Weight Bearing Capacity Up To 150 Kg, High Quality Aluminum And Must Have For Every Home Or Commercial Space. Ideal For Every House Hold, Office, Warehouse, Godown Or Shop . Corrosion Resistant Structure For Longer Life. Wide Base Design For Firm, Comfortable And Safe Climb. Closed Size:- (L) 11 cm x (B) 30 cm (Top), 60 cm (Bottom) x (H) 201 cm. Opening Size:- (L) 124 cm (Bottom) x (B) 30 cm (Top) 60 cm (Bottom) x (H) 185 cm. 1 Free Laundry Bag (Check the Images) - Offer for the very limited time. Opening Size:- (L) 52 cm x (B) 45 cm x (H) 150 cm. Closed Size:- (L) 11 cm x (B) 30 cm (Top),56 cm (Bottom) x (H) 177 cm. Opening Size:- (L) 106 cm (Bottom) x (B) 30 cm (Top) 56 cm (Bottom) x (H) 164 cm. We have also picked our own choices to give you more idea and information about top aluminium ladder in India.Check the below list and choose one that can best serve you. Now that a couple of basic parameters have been laid down, here are five of the best aluminium ladders that we could find online. Perhaps, you can compare them and analyse each of their merits and demerits and make a more informed decision. The ladder alone, weighs 6.19 kgs and is quite heavy to be honest. The product is designed in such a way as to be corrosion resistant and ideal for household use, office use etc. It’s product dimensions are set at; 52 x 12 x 152 cm and it comes with additional safety features such as a plastic top to provide you with better grip while on board. Lighter than the previous ladder, this one weighs 5 kgs and can reach heights upto 10 ft. To address the safety issue when it comes to ladders, the designers of this ladder, have made the base wide thereby, making it easier and a little bit safer to climb. The wide base helps distribute the weight over a larger surface area which allows the ladder to take more weight than usual. The exact product dimensions of this product are; 45 x 20 x 80 cm and as a whole, it is a very strong and sturdy ladder. This ladder comes in different heights. Three, four, five, six, seven and eight feet respectively. It weighs 6 kgs and it has been designed in such a way so as to conform to German safety standards. It backs this claim by having various safety features such as knee height guard rail and a non-slip surface. You get a pair of non-slippery safety shoes with them which is perfect for climbing the ladder. It’s design too, helps in addressing the safety issues with ladders and as a whole, it is one of the safest ladders you can find out there. For those people who consider a ladders ability to be compact an important criteria, this one is close to ideal. It’s slim, foldable and weighs 7 kgs. It’s considered to be a really light-weight ladder primarily responsible to use of A grade, aircraft aluminium in its manufacture. It comes with rubber feet that activate the forces of friction on extremely slippery surfaces as well. For storage purposes and to make the entire storage process more convenient, it comes with a velcro that can be attached to it to secure it in its position. The exact product dimensions of this ladder are; 77.8 x 48.8 x 8 cm and the maximum load that it can take is 150 kgs. Very similar in build and everything to the first ladder in this article, with the only major difference being size. This one is comparatively bigger, with it’s exact product dimensions set at; 55 x 12 x 176 cm. It’s weight is the only other thing which is different. This one weighs slightly more at 7.19kgs. It has the same plastic top to give better grip and it too is corrosion resistant. Go through the list of top 5 aluminium ladders and pick the best one that works for you.